This brand is new to me, and so far I like it. 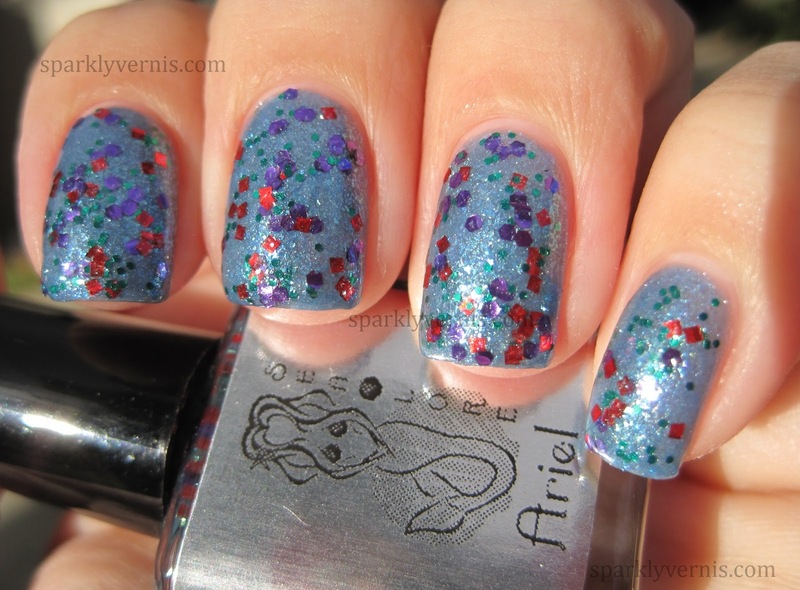 This collection consists of seven nail polishes, one of them, Ariel, is a glitter topper. 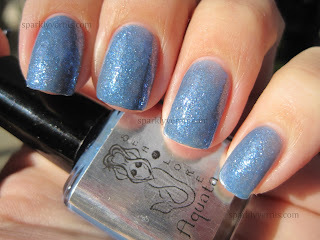 I have layered Ariel over Aquata and Attina. I don't personally like the color combination of Ariel, but I love the shimmer in it. 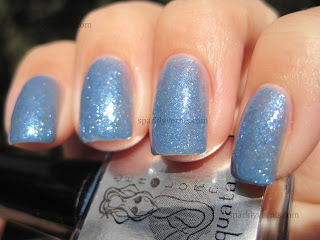 Aquata was the trickiest one to apply, it has embedded thick flakies, similar to the ones in Rainbow Honey Kawako, that make it bumpy. The color is great, and goes well with Ariel. Attina is another one with thickish flakies, but for some reason it works with this one, loving the golden tones. 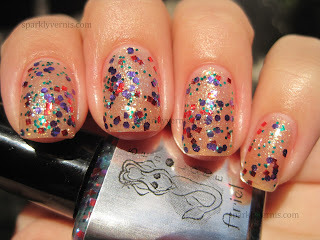 Arista is a staple glittery red. 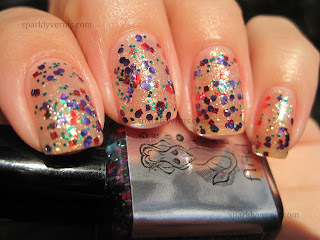 The formula on this one was great and the finish after topcoat is jelly-like. Plus the holographic hexagons are stunning. 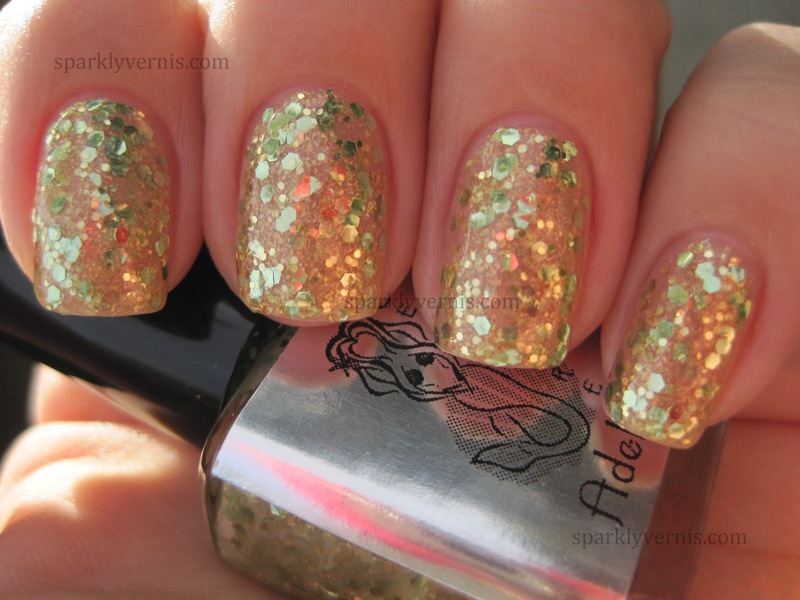 Adella is a simple shimmery chartreuse glitter, looks great by itself, but I'm positive it can be layered. Adella is really something special, because the quality of the glitter was so great that I did not want to add topcoat. Alana and Andrina are my two favorites. I want to get these in full size for sure, because I've made a dent in both bottles. I love how shimmery and sparkly they are. They are very strange and unique; the base is somewhat milky, but not too creamy if that makes sense. I love these two layered together (shown last). I really like the collection overall, it has consistently good formula, and most of them are two-coaters. I just wished these were more complex. For example Arista is a beautiful red, but something else could have been added to it to make it more interesting; to add more depth to it. 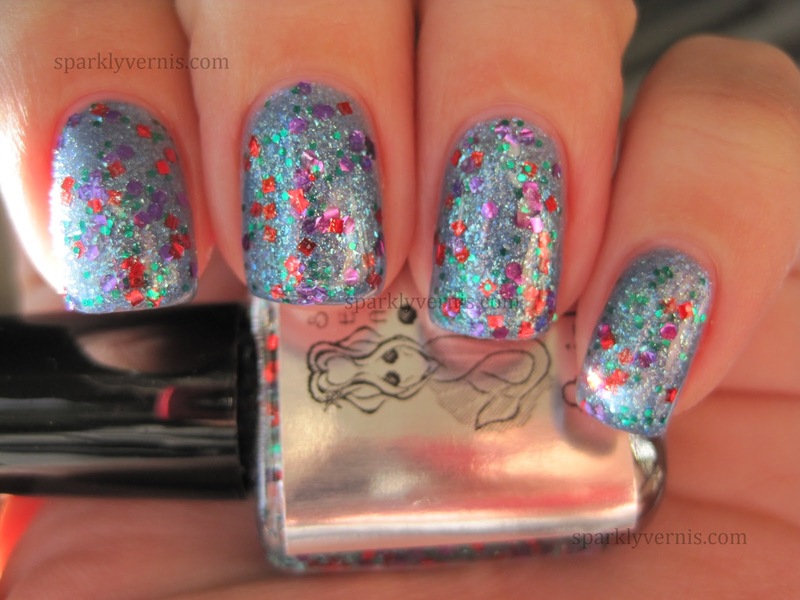 With the exception of Ariel, they are your go-to glitters, when you want to wear strictly one color. 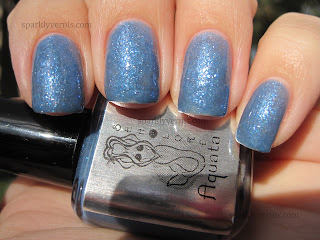 I definitely had fun swatching this collection, and I am hoping Sea Lore makes other gitters soon, so that I can try more. I love *love* Andrina, if you are a purple lover you must get this one. 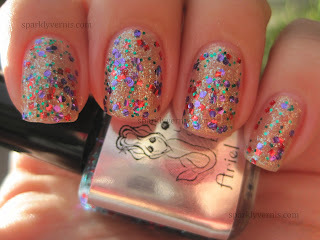 I love the theme of these, and they're gorgeous polishes!